Art Nouveau (French for 'new art') is an international style of art, architecture, and design that peaked in popularity at the beginning of the twentieth century and is characterized by highly stylized, flowing, curvilinear designs often incorporating floral and other plant-inspired motifs. Vitebsk Railway Station one of the finest examples of Art Nouveau architecture. At the end of the nineteenth century, Art Nouveau transformed neighborhoods and whole towns around the world into remarkable examples of the contemporary, vital art of the age. Even though its style was at its zenith for just a decade, Art Nouveau permeated a wide range of the arts. Jewelery, book design, glasswork, and architecture all bore the imprint of a style that was informed by High Victorian design and craftwork, including textiles and wrought iron. Even Japanese wood-block prints inspired the development of Art Nouveau, as did the artistic traditions of the local cultures in which the genre took root. Though Art Nouveau climaxed in the years 1892 to 1902, the first stirrings of an Art Nouveau movement can be recognized in the 1880s in a handful of progressive designs, such as with architect-designer Arthur Mackmurdo's book cover design for his essay on the city churches of Sir Christopher Wren, published in 1883. Some free-flowing wrought iron from the 1880s can also be considered precursors of the style, as could some flat floral textile designs, most of which owed some impetus to patterns of High Victorian design. The name 'Art Nouveau' derived from the name of a shop—what might be called "an interior design gallery"—implying that the arts of design are equivalent in importance to the "fine arts," (an axiom of the Art Nouveau movement)in Paris. Maison de l'Art Nouveau, at the time it opened in 1895 was run by Siegfried Bing, who showcased objects that followed this approach to design. A high point in the evolution of Art Nouveau was the Exposition Universelle of 1900 in Paris, in which the 'modern style' triumphed in every medium. 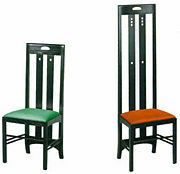 It probably reached its apogee, however, at the Esposizione Internazionale d'Arte Decorativa Moderna of 1902 in Turin, Italy, where designers exhibited from almost every European country where Art Nouveau flourished. Art Nouveau made use of many technological innovations of the late-nineteenth century, especially the broad use of exposed iron and large, irregularly shaped pieces of glass in architecture. By the start of the First World War, however, the highly stylized nature of Art Nouveau design — which itself was expensive to produce — began to be dropped in favor of more streamlined, rectilinear modernism that was cheaper and thought to be more faithful to the rough, plain, industrial aesthetic that became Art Deco. Two-dimensional Art Nouveau pieces were painted, drawn, and printed in popular forms such as advertisements, posters, labels, and magazines. 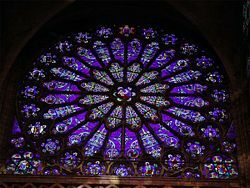 Glass making was an area in which the style found tremendous expression — for example, the works of Louis Comfort Tiffany in New York, Charles Rennie Mackintosh in Glasgow, and Émile Gallé and the Daum brothers in Nancy, France. Jewelery of the Art Nouveau period revitalized the jeweler's art, with nature as the principal source of inspiration, complemented by new levels of virtuosity in enameling and the introduction of new materials, such as opals and semi-precious stones. The widespread interest in Japanese art, and the more specialized enthusiasm for Japanese metalworking skills, fostered new themes and approaches to ornamentation. For the previous two centuries, the emphasis in fine jewelery had been on gemstones, particularly on the diamond, and the jeweler or goldsmith had been principally concerned with providing settings for their advantage. With Art Nouveau, a different type of jewelery emerged, motivated by the artist-designer rather than the jeweler as setter of precious stones. The jewelers of Paris and Brussels defined Art Nouveau in jewelery, and in these cities it achieved the most renown. Contemporary French critics were united in acknowledging that jewelery was undergoing a radical transformation, and that the French designer-jeweler-glassmaker René Lalique was at its heart. Lalique glorified nature in jewelery, extending the repertoire to include new aspects of nature — dragonflies or grasses — inspired by his encounter with Japanese art. The jewelers were keen to establish the new style in a noble tradition. For this, they looked back to the Renaissance, with its jewels of sculpted and enameled gold, and its acceptance of jewelers as artists rather than craftsmen. In most of the enameled work of the period, precious stones receded. Diamonds were usually given subsidiary roles, used alongside less familiar materials such as moulded glass, horn, and ivory. Art Nouveau in architecture and interior design eschewed the eclectic revival styles of the Victorian era. Though Art Nouveau designers selected and 'modernized' some of the more abstract elements of Rococo style, such as flame and shell textures, they also advocated the use of highly stylized, organic forms as a source of inspiration, expanding the 'natural' repertoire to embrace seaweed, grasses, and insects. Japanese wood-block prints, with their curved lines, patterned surfaces, contrasting voids, and flatness of visual plane, also inspired Art Nouveau. Some line and curve patterns became graphic clichés that were later found in works of artists from all parts of the world. St. Louis World's Fair, (1904). Entrance to the Creation exhibit. Vase by Daum (c. 1900). Dynamic, undulating, and flowing, with curved 'whiplash' lines of syncopated rhythm, characterized much of Art Nouveau. Another feature is the use of hyperbolas and parabolas. Conventional mouldings seem to spring to life and 'grow' into plant-derived forms. 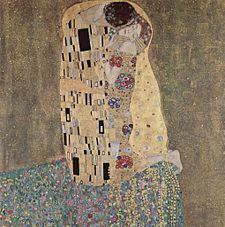 As an art movement it has affinities with the Pre-Raphaelites and the Symbolism (arts) movement, and artists like Aubrey Beardsley, Alfons Mucha, Edward Burne-Jones, Gustav Klimt, and Jan Toorop could be classed in more than one of these styles. However unlike Symbolist painting, Art Nouveau has a distinctive visual look; and unlike the backward-looking Pre-Raphaelites (although they weren't backward at all), Art Nouveau artists quickly used new materials, machined surfaces, and abstraction in the service of pure design. 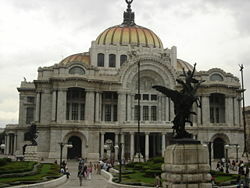 Bellas Artes Palace in Mexico City. Art Nouveau did not negate the machine as the Arts and Crafts Movement did, but used it to its advantage. For sculpture, the principal materials employed were glass and wrought iron, leading to sculptural qualities even in architecture. Art Nouveau is considered a 'total' style, meaning that it encompasses a hierarchy of scales in design — architecture; interior design; decorative arts, including jewelery, furniture, textiles, household silver and other utensils, and lighting; and the range of visual arts. More localized terms for the phenomenon of self-consciously radical, somewhat-mannered, reformist chic that formed a prelude to twentieth-century Modernism include Jugendstil in Germany and the Netherlands and skønvirke in Denmark, named after the avant-garde periodical Jugend ('Youth'), Młoda Polska ('Young Poland' style) in Poland, and Sezessionsstil ('Secessionism') in Vienna, where forward-looking artists and designers seceded from the mainstream salon exhibitions to exhibit on their own work in more congenial surroundings. In Russia, the movement revolved around the art magazine Mir iskusstva ('World of Art'), which spawned the revolutionary Ballets Russes. In Italy, Stile Liberty was named for the London shop, Liberty & Co, which distributed modern design emanating from the Arts and Crafts movement, a sign both of the Art Nouveau's commercial aspect and the 'imported' character that it always retained in Italy. In Spain, the movement was centered in Barcelona and was known as modernisme, with the architect Antoni Gaudí as the most noteworthy practitioner. 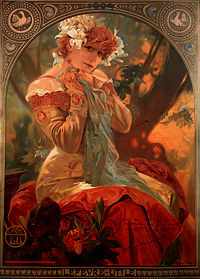 Art Nouveau was also a force in Eastern Europe, with the influence of Alfons Mucha in Prague and Moravia (part of the modern Czech Republic) and Latvian Romanticism (Riga, the capital of Latvia, is home to over 800 Art Nouveau buildings). 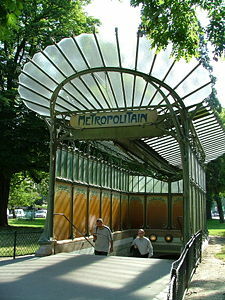 The entrances to the Paris Métro designed by Hector Guimard in 1899 and 1900 are famous examples of Art Nouveau. Designed in 1899, the Porte Dauphine station exhibits Hector Guimard's only surviving enclosed edicule of the Paris Métro. Art Nouveau, "1890-1914 at the National Gallery of Art". www.nga.gov. "Réseau Art Nouveau Network". 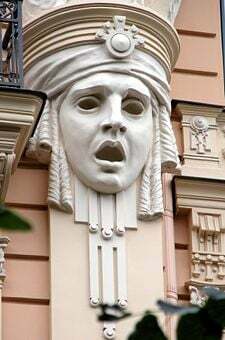 www.artnouveau-net.eu. "Links for Brussels, Capital of Art Nouveau. 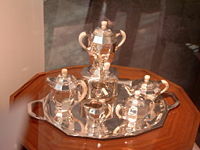 www.senses-artnouveau.com. "Art Nouveau World-Wide: Links and texts". www.perso.wanadoo.fr. "Artist in Paris, Nancy and Europe" www.lartnouveau.com. Art Nouveau Links & History. www.achome.co.uk. This page was last modified on 15 April 2016, at 15:55.